"A matter gateway is active on Carmarthen IV. Losses are mounting, send everything; everyone. Send them now. The Khanate have returned." Shortly after I launched the new Ion Age and its website we released IAF006 Legionary 1st Tesseran, sculpted by Sam Croes, which turned to 15mm scale the 28mm miniatures we already had. This began the process which was building towards the coming book. Over the last three years or so we have released more Legionaries, Warlords, Nox and Pioneers plus Malig space goblins making an excellent force for the Khanate but all working towards a much larger goal. We will be releasing a lot more codes before, alongside and after the new book to make the Shia Khan a full all arms force in The Ion Age. What we have right now in February 2017 you can see on the website HERE. This article gives you a look at some excerpts from the manuscript of the book as well as its general contents plus some extra special early looks at both concept art and sculpts which are coming up. We are at the point of playtesting the new troop elements and vehicles in the book and we expect to finish this during February all being well. We hope to have the book ready in time for the April offensive which we do every year. So what are these concept pieces first, second and third shown. 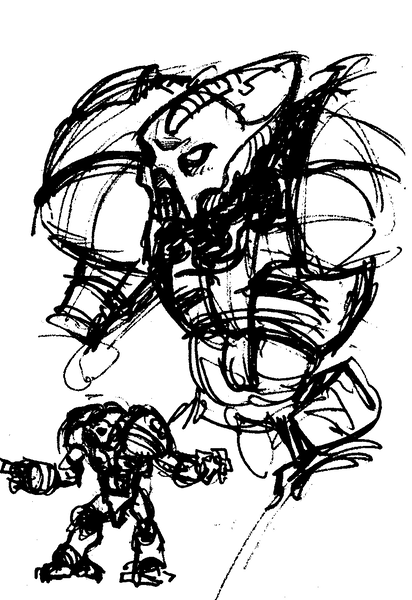 The first concept sketch shows you our idea for the MkII Psychoborg. Updating on the original robotic terror machine with a metal human skull and massive shoulders we kept the look but changed the style to make it better suit the newer miniatures which are coming beyond the original ideas. The Psychoborg is one of the two reasons that the Prydian Precinct came up with Battlesuits...to put them on an equal footing. These robots are twice the height of a man. This and the 'humanscare' ability of these robots which drives soldiers away in terror makes them formidable foes. We intend an easy kit with several weapon options and posable head. 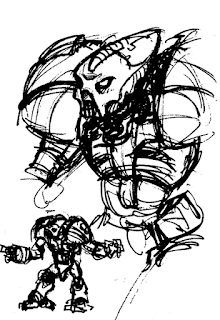 The second concept sketch is an experimental one for bringing in female characters to the Khanate Empire. Drawn in non battle dress rather than the full glimmer suit worn by all legionaries it shows the Elvish nature of Legionaries. Above her is a sketch concept of a maser weapon which we are considering putting into the statistics tables. 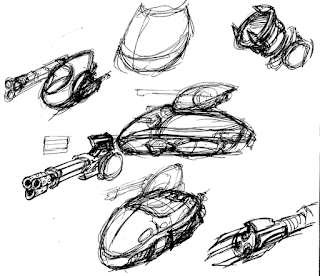 The third sketch is now outmoded in that we have moved beyond this in our designs for the Khanate vehicles which will go up against our Adders, Mullo's and of course Taranis tanks. The 'bulbous shoe' design was replaced with a conjoined tri-wheel arrangement which better suits the narrative of the setting in that every soldier and every vehicle these aliens possess must be brought through a comparatively narrow Matter Gateway from far across the galaxy. The Matter Gateway is the central focus of this new invasion. 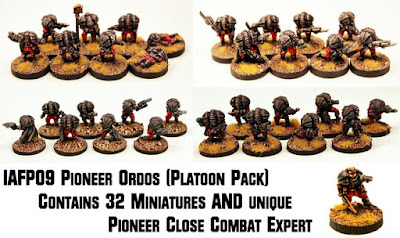 While we have just completed having a full 'Ordos' (platoon pack) for each Khanate troop type with a Pioneer Ordos we have now turned most of our 15mm scale concept sketches into miniatures which will be released across this spring into summer. No confirmed release dates at this time but as a treat here are a couple of photos of sculpts with a little information on each. Were you a fan of the excellent computer game 'Joust' way back when? I was. 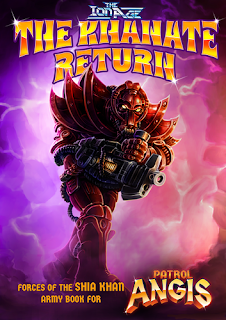 Our goblin Maligs love the crazy dangerous aspects of space opera warfare and as a result they have insane vehicles such as the Infernus Ball Tank with twin flame throwers and the Orba ball bike which is very difficult to control. We are ramping this up by another notch with the 15mm scale Skrak Terror Birds above. These vicious giant birds each take a single goblin rider into the fray...unless they decide to eat the rider that is. We will have a pack of these cavalry with bird only option plus a handler and nest pack too. The second image shows you parts from one of the two portable weapon platform code sets which are coming for the Khanate. Operated by Legionary gunners the 'Selen' platforms are much like the Espaten ones for the Retained Knights in that they have options for different weapon mounts. These weapons include the Maia Cannon and the Juno Laser Cannon among others. There is also a second platform with a 'slaved' operator called the 'Hypnus' with several other weapon options. Look for these codes and others for the Khanate from March onwards at The Ion Age. But what about the book...the loved 'fluff' that consumes a thousand hours of my life each time it is published. What will be in the Khanate Return title? Read on in part two of this article below with excerpts of the fiction and a look at the working cover of the book. We then end with a little surprise. A thousand years ago the Ban of Prejudice was lifted when in the climactic battle for Aldan IV the accursed Templars detonated the Aldan Crucible and in doing so created a both a dark age and the end of the Great Khanate War. Their matter gateway in the Aldan system destroyed the Shia Khan Empire had no easy way to reach the worlds that became the Prydian Precinct as their empire lay so far away that no Dragon Ship could navigate to that region of space without immense difficulty. Gradually the Shia Khan became a memory and then a legend held by folk as a tale and nothing more. Had it not been for the occasional wreak and discovery of artefacts they would have remained that way. Had it not been for Hugo Sevaris the Khanate would have faded away. But Sevaris became the most notorious traitor in human history when he used arcane knowledge to activate the matter gateway in the Camarthen star system. Despite a desperate action in the deep Belkus Labyrinth the Camarthen Planetary Militia with the aid of the few hundred Retained Knights of Prydia on the planet could not stem a tide of Shia Khan troops which emerged from the purple light of the matter gateway. A civilian fusion reactor taken from a nearby city was detonated and the Belkus Labyrinth destroyed burying the gateway and those coming from it under hundreds of feet of stone and earth. A message was sent to New Glastonbury at the fastest possible speed. It did not take long for the Legions of the Shia Khan Empire to dig their way to the surface and begin once more their determined drive to conquer mankind. Amy Barker was terrified. She faced death and knew that her life was at an end. The last hour had been a fleeting panicked flight from an ever escalating battle which it was clear the Camarthan planetary militia were losing and losing badly. It was hard to believe that she had only been on this planet for two weeks and now she was alone, kneeling next to a reprogrammed fusion reactor that had only just arrived from Pelacan city. It had been by sheer chance that she had taken this research posting and also chance that she had ended up in this small sealed chamber while all those she had met since her arrival were either dying or already dead. With a shrill note her com-tel wrist communicator burst into life. Amy pushed the small button on its side to accept the incoming private call. Immediately it's small speakers echoed to the rattle of gunfire and shouting voices. All those sounds had been blocked by the heavy door to the chamber in which Amy now knelt. There was a pause as a voice shouting orders next to the professor made him stop momentarily before continuing. Amy opened her mouth but Turner continued first. With a howl of distortion the transmission cut out and a moment later Amy felt more than heard the booming echo of very nearby energy weapons fire. It made dust fall from the roughly hewn ceiling of the chamber, some of which landed in Amy's now filthy blond hair and also upon the squat frame of the reactor. She lifted her hand and let it hover over the inert flat display screen in the middle of the reactor's casing. Could she make herself, will herself, to press the button that would activate the already set programme to overload the portable fission reactor and create an explosion. She glanced at the door, the only way into the chamber. Outside that door was something supposed long vanquished but very real indeed. Forces unchained by their greedy and naïve curiosity. Looking intently at the cracks in her fingernails Amy held her hand steady but unmoving over the display. Her thoughts tried to rally, tried to overcome the rising blind panic that threatened to overcome her. She realised that her whole body was shaking and despite her best efforts she could not prevent the movement or even reduce it. Her mind continued to seek for a way out, an avenue of escape, but it was pointless. Professor Turner had been in the chamber beyond the one next to where she was. There was one door into each of those chambers and beyond that she knew were kilometres of tunnels before she could even begin the long ascent towards sunlight. She was trapped. Well and truly. Amy was brought from her thoughts jarringly back to the present by a hollow boom that reverberated around the chamber. She looked to the door. Had it moved. No, she realised the rock wall around the door had splintered and been pushed towards her and she could see flames licking around the gaps. They were here and with tears steaming down her face Amy knew she was the only human now left in the Belkus Labyrinth. It was time. They would pay for the dead, for their needless killing. With that Amy strangely felt at peace. The choice has been made. She brought her hovering hand down hard on the activation stud and the display lit up. It was a short sequence and it had begun. It could not be stopped. A thrumming drone began to fill the chamber as the reactor reached its operating levels and then began to exceed them at an increasing rate. Another boom followed by the crashing fall of rock threw Amy to the ground. With blood in her eyes she managed to rise to her knees as hulking shapes entered the scarred chamber. Amy knew only seconds remained and as they surrounded her and then the now pulsing and glowing reactor. Amy grinned through red rimmed teeth. The ten Retained Knights, all that was left of the 6th Lance, were ready in a single line and the final reminder over comm link into their helms was not necessary. All had their weapons ready and aimed at the chipped rubbacrete entrance to the abandoned building. Once it had held children who had gone about their daily learning without knowledge that they would soon die and all that would remain would be faded pictures on grimy walls. The Retained knew that three Warlords were about to come through the entrance. Warlords, the toughest of the slave races used by the Khanate each with the might of five men and carrying guns that were the envy of portable weapon teams. Prydian remote drones had picked up the trio who were evidently not expecting to find enemies in the building. Even so Warlords were very hard to kill even with 12.5mm AP rounds from an Angis Rifle. Stooping to get in the first Warlord entered the long dusty room its ten foot tall frame filling the whole entrance and the lowered barrel of its Maia Scatter Cannon noisily scrapping the floor. As it straightened up the next Warlord came in behind and as it did so the first alien saw the knights and immediately started to raise its weapon. Without a command the ten Retained opened fire. The air was filled with over a hundred Angis bullets which tore great holes in the Warlord's lorican armour and then into its body. The 12.5mm rounds detonated with a bang and then the Warlord's head simply exploded and it pitched forward into the floor with a wet crash. Behind the fallen foe the next Warlord had its Mars 20mm Chain Cannon almost to the right level to open fire and its multiple barrels were spinning. A number of the Angis round struck it and giant paused. The pause was fatal as the two Retained, one either end of the line, each armed with an Anvil 888 launcher let fly their own projectiles. They had waited until the first enemy had dropped and the two TX9 Hollow Charges, essentially just really big 60mm bullets, hammered into the second Warlord just as its finger activated the chain cannon. Its left arm was thrown away and its right leg blown off at the knee which caused the 20mm shells of the chain cannon to rip into the wall and ceiling of the room missing the knights. There was blood as mist in the air and it would take the Retained a number of seconds to eject the spent magazines from their rifles and load more. They had brought down two of the monsters but now the third was in the room and its Helios 80kw Atomic Destabliser went off with a scream of super heated vapour. In the blinding flash of loosed energy six of the knights were obliterated, their powered armour no protection at the destabilising of bonds at the atomic level. The remaining four Retained on the right of the now gone line fell sideways as the red and white peeled and blistered from their titanium alloy armour. But their hands were slamming magazines in all the same. It would take the Helios time to charge again and perhaps the Humans would get lucky....perhaps. These excepts are taken from the discovery of the alien artefacts on Carmarthen IV (also known as Carmarthen Prime) and from the story of the fight to stop the Khanate in the Belkus Labyrinth deep underground. Then lastly the hopeless campaign to save Pelcan City from the advance of the Legions as they try to take the planet. 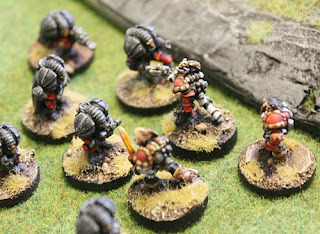 It is a really cool story and campaign giving a great number of tabletop gaming scenarios for you to play Patrol Angis. The book has still to have its final contents confirmed as, with every project I take on, I always create too much content and then have to trim it down but here is what currently will be in the book. 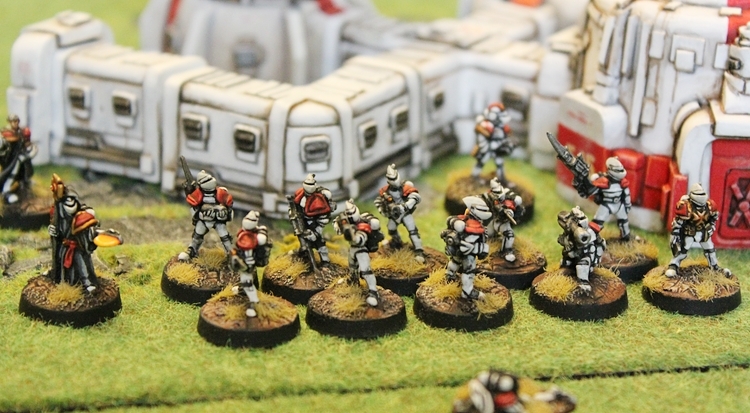 These are broad sections to give you an idea of just how this Army Book for Patrol Angis will expand your Ion Age gaming. 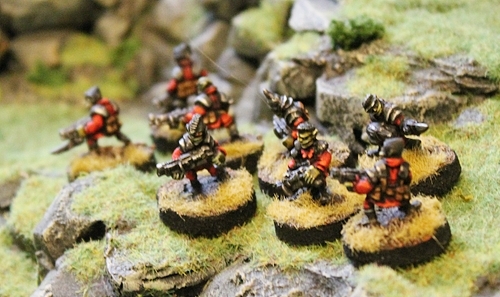 features in three great scenarios set in the Camarthan Campaign. This month's releases are actually online right now and the news for them will happen next week in detail. 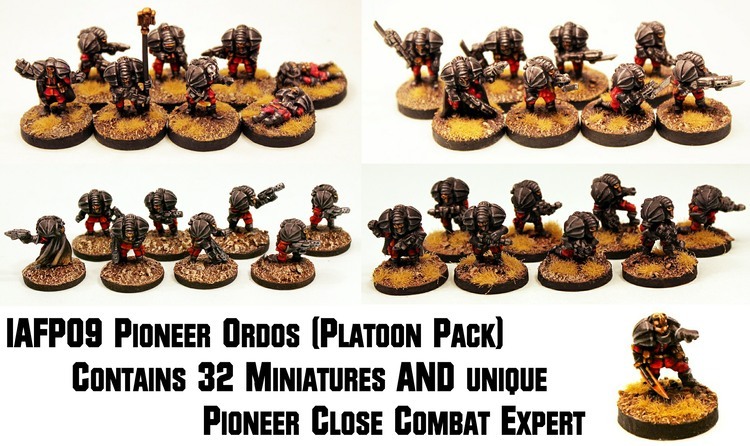 Brand new Shia Khan Pioneers two new eight figure packs plus a Pioneer platoon pack (33 miniatures) with extra unique free miniature in it. Plus we have free postage this weekend in conjunction with Alternative Armies in celebration of the merger of 15mmcouk back into the now massive choice Alternative Armies website. Check out the new releases HERE and all orders over 12.00GBP get free worldwide shipping plus Reward Points on their account and this month's free monhtly miniature too. Offer ends 9am GMT Tuesday 21st February 2017. Excellent! Thanks for Reading and ask any questions you have here or on the blog or by email to info@theionage.com.